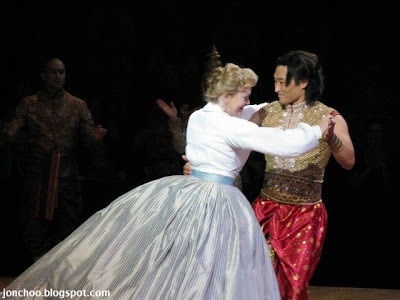 We were fortunate enough to gain some cheap tickets for Saturday evening's performance of the limited run The King and I musical at the Royal Albert Hall. Maria Friedman stars as the confident English teacher Anna opposite Daniel Dae Kim (Lost) as the beleaguered King of Siam. I won't comment about the story, as I am aware that most people would have experienced the classic tale one way or another - and if you haven't, you really ought to. Daniel Dae Kim was actually pretty funny, and had a good voice. Sadly he does not make an impressive or even mildly scary king. Maria Friedman on the other hand was simply brilliant as the English teacher. The sound set in the middle of the Royal Albert Hall is impressively build with the use of nice water features. The orchestra score is performed by the brilliant Royal Philharmonic Orchestra under the direction of Gareth Valentine. An enjoyable if predictable take on a well loved story, but Royal Albert Hall makes for a bad venue.